Click on any photo below for a slideshow. This entry was posted in Countryside, Garden, Nature, Plants, Wordless Wednesday and tagged Countryside, Garden, Nature, Plants, Spring. Bookmark the permalink. ← In a Vase on Monday: Rhubarb and Custard? I love the spring flowers especially in the dappled light. Very beautiful Cathy!! I love all of your flowers, the slide show is cool 🙂 You are about 2-3 weeks ahead of us. Enjoy your evening! Thanks Michael! I have plenty of these early tulips so my tulip season lasts until May. The Hepatica and Vinca were actually fairly late this year. What delightful spring flowers you have. The hepatica are lovely, I really must try to find some to put in my garden. I love the Spring Corner mix of bulbs – so cheerful! Thanks Eliza! That spring corner looks lovely now, but in summer it is hard to grow anything in dry shade there, so it will be a challenge to improve on it for this coming year! Maybe you can do containers? but there’d still be the watering to do, which can become onerous by the end of the summer, I suppose. Dry shade is a challenge! Watering is a problem, so I will have to put my thinking cap on! Thank you so much Eliza! Yes, a few good ideas there. Especially the geraniums which do well in various other parts of the garden. 🙂 Ajuga grows wild everywhere here, and Lamium too, but I also like the idea of spurge. Thanks! You’re welcome. I, too, love all the different geraniums – they are beautiful and so hardy. I’ve seen them growing in a gravel driveway next to a blistering hot stone wall – talk about tough! My favorites are G. macrorrhizum, sanguineum var. lancastriense, ‘Johnson’s Blue’ and cantabrigience. I also grow G. phaeum and renardii, which are less typical. Good growers all. Thank you Elizabeth. Lovely to hear from you! Aren’t they gorgeous? Here’s to spring and all its welcome beauty. A woodland in spring- wonderful. Is that a Pasque flower, if so I haven’t seen that colour before. It is a plant I should search for, thanks for reminding me. Yes, Pasque flowers grow wild here but are then usually bluish-mauve. I have this red one as well as a purple and white one. They are pretty robust and amazingly survive dry heat all summer and still look good. The seedheads are a show for many weeks. You have a beautiful woodland setting. I always admire your hepatica. I am envious of your woodland Cathy, it looks so inviting. I love the hepaticas too, are they scented? What a beautiful slideshow. I can see you can grow wonderful hepaticas and the Pasque flower is stunning. Thank you Chloris, although I can’t take credit for growing the Hepaticas as they are all wild. 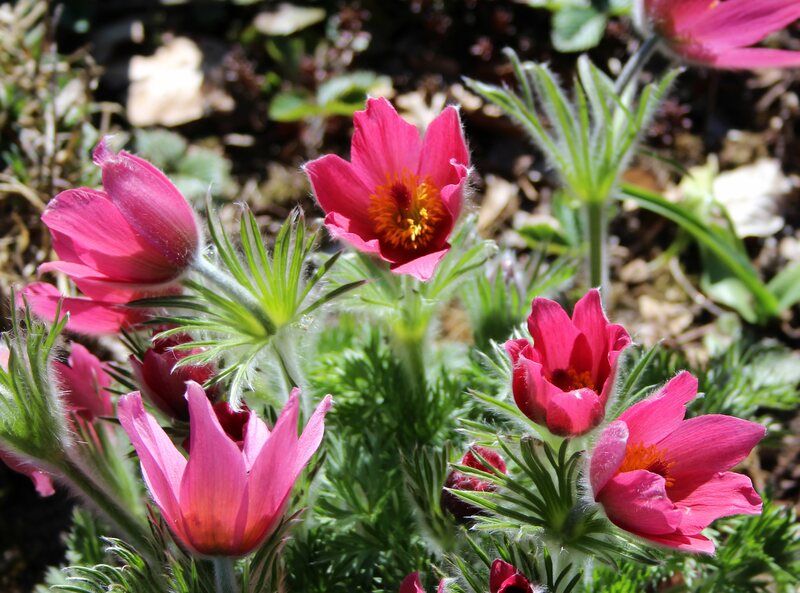 But I am pleased with the red Pasque flower which has been going strong for several years now. The blue ones grow on the hillsides here, but I rather like this red one. Yes, Hepatica is a wild flower, and difficult to grow in a garden. The spring corner is always lovely and fades far too quickly, but there are still more tulips to come which I am looking forward to! It is lovely to be outdoors more often, but rather cool again today – just 10°C. Have a lovely weekend Debra! Such wonderful spring flowers. I love the Hepatica and the Pulsatilla also. I have got some smaller Pulsatilla plants in different colours, but this pinky red one is my favourite.